As the time of Halloween approaches, accompanied by commercial craziness as well as simple gaiety and play, it has me reflecting on the underlying energies of this time of year and the original traditions that sought to honor them. In the northern hemisphere, when the effulgence and bounty of summer dwindles and yields to the autumnal forces of decomposition and transformation, many ancient traditions also recognized it as a time when the veil between the world of the living and the realm of the ancestors becomes more permeable. For these traditions it is a time to remember and honor our ancestors, to appreciate them and thank them for the life they have provided us. Many of our modern celebrations actually derive from ancient, indigenous traditions that honored the dead at this time of year. Our highly commercialized celebration of Halloween originated in England as the night of “Samhain” (pronounced Saween) in the Celtic tradition. It was a time of honoring the dead and marking the change of the seasons. Christianity then celebrated ‘Alholowmesse’, or All Saints’ Day, at the same time as a way of remembering their beloved saints but also introducing the concept of evil spirits and hell realms that was not part of the original celebration of Samhain. At the heart of all these traditions lies a recognition that the veil between this world of the living and the realm of the ancestors thins at this time of year. 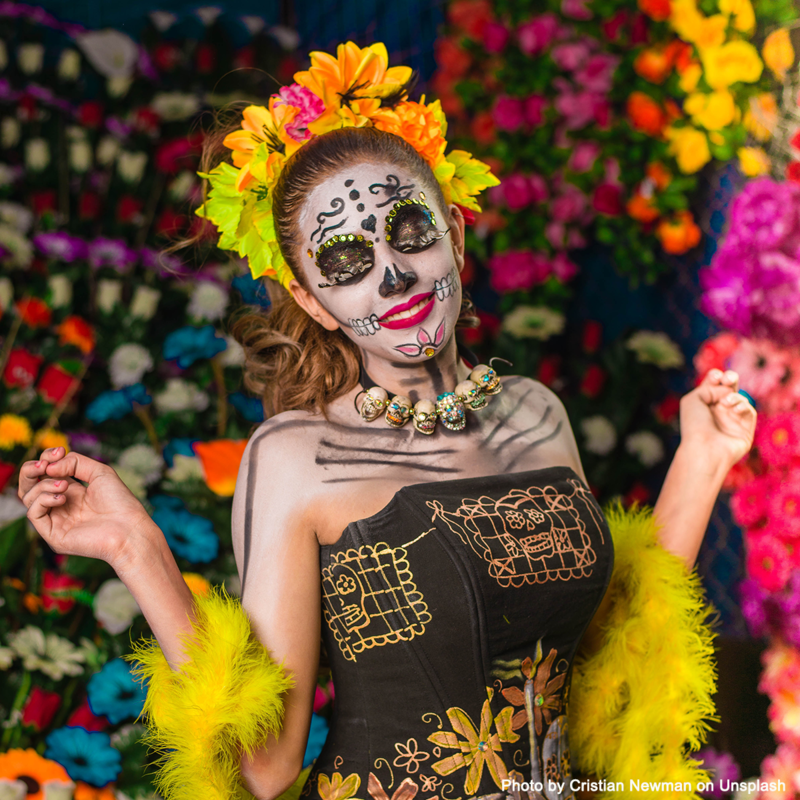 In Mexico “Día de los Muertos”, or Day of the Dead, is actually rooted in ancient Aztec and other indigenous traditions. The Aztec honored their dead with fiestas and rituals during the harvest season. They understood that the souls of the dead return to visit the living families in homes and cemeteries at this time. Today it has become a colorful and celebratory festival when families gather and set up altars to remember their loved ones. In India the unbroken tradition of “Pitru Paksha” has been celebrated for thousands of years. Known as “fortnight of the ancestors” it is a 16-day celebration, marked by the lunar calendar, in September/October. This tradition also recognizes that during this period the ancestors return from “Pitru Loka” (the realm of the ancestors) to visit the homes of their families. The current, living generation are called to offer their love and repay their debt to their ancestors through rituals and offerings of food to the community. At the heart of all these traditions lies a recognition that the veil between this world of the living and the realm of the ancestors thins at this time of year. At the same time, the reason why traditions have rituals conducted by elders is that sometimes we can get entangled with unhealthy energies if we lack awareness. While the costumed ghosts of Halloween seem totally fanciful, they point to our intuitive knowing that ghosts actually exist. The great wisdom traditions of the world all recognize that when we die we go to a realm where we must sort through any unfinished business of life. We’ll borrow the term “bardo” from the Tibetan tradition to represent this realm. When someone dies in an unexpected or traumatic way, or when they die with a lot of unresolved issues from their life, they can sometimes get stuck in the bardo, continuing to attempt to communicate with the living or to inhabit places that were familiar to them. Without help or guidance they have trouble moving on. These souls are what we call ghosts. They will eventually find their way and the greatest service we can do for them is to refuse to engage with them, except to encourage them to move on to where they need to go. Traditional cultures have always taken care of their dead by offering ‘funerary rites’; rituals designed to support the soul to navigate the bardo on its way to its ancestral homeland. As our modern culture strips traditions of these rituals, we also rob our loved ones of the support they need to find their way after death. How might we honor the energies of this time in a grounded way? Our ancestors are different from ghosts. When someone passes through the bardo realm successfully, they move on to the realm of their ancestral homeland. Although we might continue to relate to an individual who has died, if they show up in a vision, in a dream or as a felt presence, it is not their individual soul returning to support us. Instead the presence of the ancestral field, made up of all our ancestral energies, takes the form or the voice of a loved one that has died in order to communicate to us in a way we can recognize. In a very real way our ancestors are always supporting us. At this time of year we can both feel their presence most acutely as well as show our gratitude most fully. Set up an altar for your loved ones that have died. This might include pictures of them, ornaments or items that belonged to them, things that represent what they loved, favorite foods, flowers, a candle. Take flowers and candles to their graves. Have a picnic and tell stories about them. Spend a little time reflecting on your appreciation for who they were and your gratitude for what they have provided for you. Offer food to the community on their behalf. Perhaps send something to a food bank, volunteer at a soup kitchen or make a lovely meal and share it with your friends while telling stories of your favorite souls who have died. Participate in a celebration or ritual being offered as part of a tradition, especially if it is being conducted by someone grounded in that tradition.